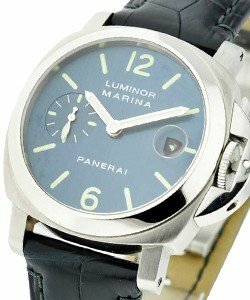 Panerai is the most famous Italian watch company. But keep in mind, Panerai is now produced in Switzerland, not Italy. Originally founded in Florence in the 1860's, this "watch workshop" was commissioned by the Italian Navy to produce a watch that could be easily read underwater. This early prototype was actually fitted with Rolex parts. 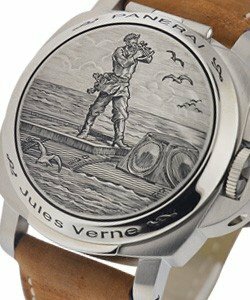 Currently Panerai produces a very limited number of pieces and therefore keeps demand high. Panerai (aka 'Oficine Panerai') has always made its watches as Limited or Special Editions, and produces fewer watches than the market demands, creating even higher demand for these pieces and long waiting lists. 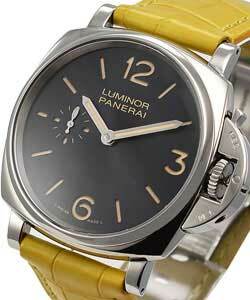 This has created a cult-like following of Panerai Luxury Watches, rarely seen with any other luxury watch brand. The Panerai-obsessed are commonly called 'Paneristi', and this exclusive but famous fan base has brought even more attention to this elegant, modern and very stylish, luxury watch brand. Panerai Watch lines are released under one of four different collections; 'Panerai Historic', 'Panerai Contemporary', 'Panerai Specialities', and 'Panerai Special Editions'. Regardless of which collection you're considering, it's good to note that all Panerai models are very hip, fashionable and extremely versatile. Many Panerai watches come with an extra rubber OEM Panerai strap. 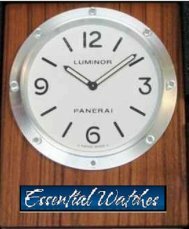 For those seeking an uncomplicated style of watch, the Panerai (Officine Panerai) 'Luminor Base Model' is a great choice. Avail in steel with either a black or white dial, the 'Panerai Luminor Base' is classic, clean, and goes with any outfit. Those looking for a classic but modern looking chronograph, should look at the 'Panerai Luminor Marina', with hours, minutes, small seconds and date function, this watch comes on a brown leather or alligator strap, making it appear a little more 'outdoorsy' and is also avail with black or white dial. The 'Panerai Luminor Marina watch' is inspired by one of the first Luminor models of the 1940s, and is equipped with an 8-day Angelus movement. If you're thinking about diving into the deep, the 'Panerai Luminor Submersible' is a great choice. This professional divers watch is a modern version of a in a modern style of a model produced in 1956 for the Egyptian Navy, and features an 8-day Angelus movement, a small seconds dial at 9 o'clock, and a rotating bezel with reference markers enabling the duration of a dive to be read quickly. At 44mm, and avail in brushed steel as well as titanium, the 'Panerai Luminor Submersible' is an incredibly stylish diver's watch. 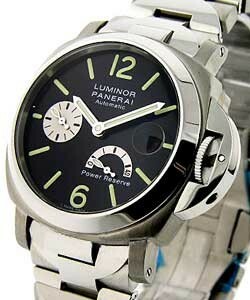 Another popular Panerai 'Luminor' model is the 'Luminor GMT'. This handsome Panerai timepiece is a dual time watch, featuring a fourth hand to keep track of a second time zone. This fourth hand rotates once every 24 hours and can be set independently from the 12-hour hand. With a magnified date display at the 3 o'clock position, the 'Panerai GMT' provides extremely useful and easily readable on a classic Panerai dial. Bold and modern, the 'Panerai Radiomir' range consists of the 'Radiomir' and 'Radiomir Black Seal', based on the design of the 1938 Panerai watch, created for the Royal Italian Navy. Characterized by its large size and water-resistant case, the the 'Radiomir' is known for its extreme legibility underwater and its classic black Panerai dial. Elegant but still masculine, the 'Panerai Radiomir' case measures 45 mm in diameter, and is avail in steel and rose gold. If you're looking for a smaller version; the '42mm Panerai Radiomir' is also avail in titanium, steel and 18k rose gold. If looking for a larger case, and longer power reserve, the 'Radiomir 8 days' is fitted with the calibre P.2002, the first movement developed by 'Officine Panerai', and features the functions of hours, minutes, small seconds, date and 8-day power reserve. This last function enables the watch to run for 8 days without winding, and was inspired by the Angelus movement of the 1940s. The 'Panerai Radiomir 8 days' is housed in an extra-large 45mm case.